Liam Kirk is blazing a trail in North America after being snapped up in the NHL Draft this summer by Arizona Coyotes. But he’s working toward achieving something no British player has ever done in icing in ‘The Big Show’, currently playing for OHL side Peterborough Petes as he looks to make the grade. British Ice Hockey will bring regular updates of his progress in North America and hope to follow him all the way to the top, starting with a big week for the Petes. In the last seven days, they snapped a four-game losing run and Kirk picked up his first point in 14 games as former Newcastle Vipers coach Rob Wilson’s side got back to winning ways. Last Friday’s 5-2 win over Sudbury Wolves helped restore that glorious feeling after that disappointing run of form, as Kirk got a shot on goal, but ultimately played a part in what was a huge win for them. Declan Chisholm, Pavel Gogolev and Nick Robertson each recorded a goal and an assist, while Semyon Der-Arguchintsev and Cole Fraser added two assists each. Brady Hinz scored an empty net goal to seal the victory. Hunter Jones stopped 31 of 33 shots in his league-leading ninth win in the game. 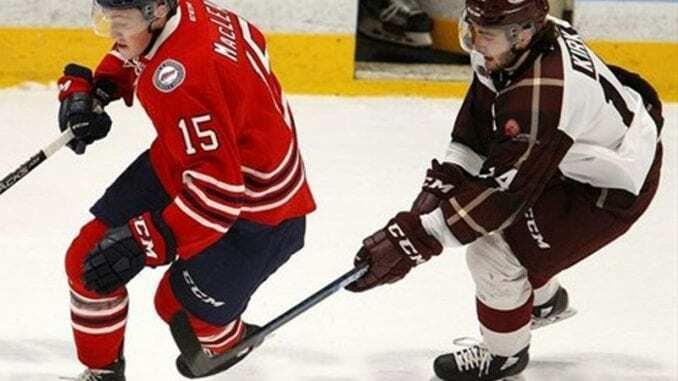 The Petes made the journey to Grey County to face Owen Sound Attack on Saturday night, looking to build on their sudden upturn, but it wasn’t to be as Midwest Division side took the victory. It was another low key game for Kirk, with a shot on goal, but overall, it wasn’t the Petes’ night as Attack won 5-2 to help their own cause. Nick Robertson and Adam Timleck were on target for Wilson’s men, but it wasn’t to be in the end. On Thursday, it was ‘Plaid Night’ in Peterborough as the Petes entertained Conference rivals Oshawa Generals and it was here, Kirk broke his pointless drought. A tenth win in 17 games so far saw Petes stay in the top five in the overall standings and moved two points ahead of Oshawa (8-5-2) for fourth place in the OHL’s Eastern Conference. Chris Paquette and Nick Isaacson scored in regulation for the Petes, with Kirk lending a hand in Isaacson’s goal – his fifth point of the season. The former Sheffield Steeler also tested the Generals net with five shots on goal, but on this occasion, none of them found their way in. But Pavel Gogolev scored 38 seconds into overtime to give the Peterborough a 3-2 win over their rivals on what turned into a good night for them. Petes travel to Kingston Frontenacs tonight (Friday) look for a second straight win and their first win at the Frontenacs in just over a year and four attempts. Frontenacs are on a poor run of two victories in their last 12, but the Petes have won the last three – albeit all at the Peterborough Memorial Centre. The Petes are back home on Tuesday night, local time, to face Kitchener Rangers, their first meeting of the season and the Rangers with a healthy run of six wins in their last seven.